For quite a while, our Dometic washer/dryer combo hasn’t been spectacular when it comes to drying our clothes. Just recently it started throwing a code: E3A whenever we would try and dry a load. After doing some research, none of which Dometic helped with, we determined that the issue was a bad thermistor limit switch. 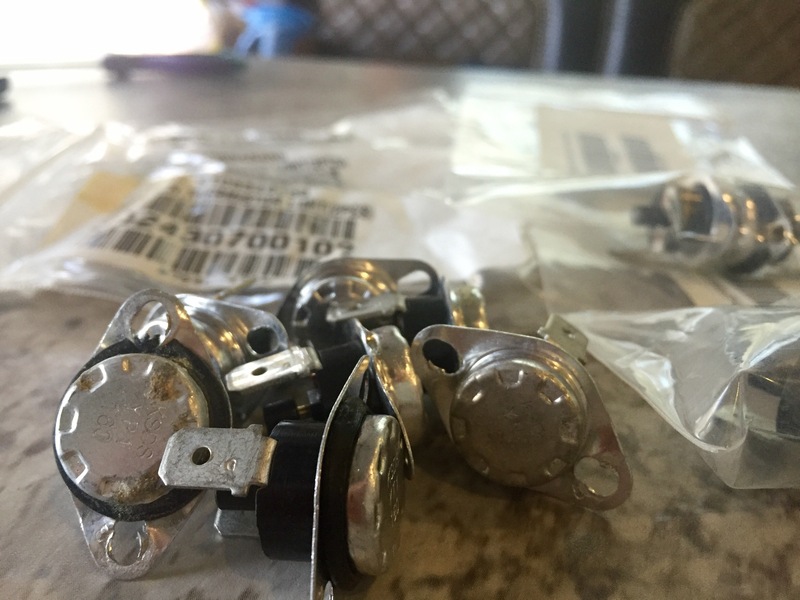 We ordered the set directly from the Dometic customer service line but half the parts were used when they arrived. (We actually ordered 2 sets bc they charged $5 for shipping.) When we called to tell them, we then had to wait another week for “new” parts, but when we got those, half were missing the seal on the one piece. It’s just a little gasket type o ring but it kinda needs to be there. So they rushed us even more new parts and these are finally the right ones! Even the packaging looks a lot better. So we got the new ones in (good thing we had an extra one because one lives permanently in the bottom of the unit… Oops). I just folded our first load of clean, DRY clothes in a really long time! Lesson learned: clean the compressor every few months! They say once a year but with as much laundry as we do being full time and Allen working, we’ve decided 3 months sounds about right! If anyone needs a thermistor limit switch, we have some extras! This entry was posted in 2015 Grand Design Momentum 385TH, Camper, DIY, Projects, RV and tagged 5th wheel, camper, camping, clothes not drying, DIY, diy fix, Dometic, dryer, E3A, error code e3a, fifth wheel, home, laundry, RV, RV life, RVing, traveling, washer, washer dryer combo by Rachel Gillen. Bookmark the permalink. So sweet of you to offer! We just went full time RV living and bought a dometic washer/dryer unit for our RV. We are new to this but love the lifestyle. Our unit quit drying just recently and we can’t seem to get Heartland on the ball to come out and fix things that seem to pop up. Our unit is giving us that E3a error code so I googled and saw your offer. So ready to fix the thing myself!!! So tired of running to the laundromat all the time! I would greatly appreciate one! If you still have an extra one available. Hi Marie! I’m glad you found our blog. So… I just had the bag of these thermistors IN MY HANDS not two weeks ago. We have since gotten a new washer/dryer combo (a Splendide). We were having some problems with it so I dug these out thinking they may be interchangeable if this was the issue. It turns out it wasn’t and we fixed the problem on the phone with Splendide (they are a whole lot easier to work with from a consumer standpoint than Dometic ever was!) I remember asking Allen if we should get rid of the old thermistors but I can’t remember if we did or not. I’ve spent the last half hour checking everywhere I can think to look but haven’t had any luck yet! I’ll keep looking and check out in the big cubby and toolbox later today. In the meantime, have you called Dometic directly? I’d think you’d have more luck dealing directly rather than going through the RV manufacturer. They MAY send you some parts as a goodwill gesture, but don’t quote me on that, it just depends on who you get at that company and what kind of mood they are in. We wound up getting a new unit because it kept throwing the code even after replacing the thermistors. We finally had a mobile tech come out and look at it and the computer board was fried, they didn’t have a replacement because they don’t make w/d’s anymore so they basically bought us a new unit as a “goodwill gesture”. I will let you know if I find them later, but until then good luck! Have you checked anything with a volt meter? Just wondering if there’s something with the computer that isn’t working… How is Edgestar customer service?